The Cairngorms National Park Local Development Plan (LDP) identifies a number of sites for new housing development. These include site H1 at Carr-Bridge, which is allocated for up to 72 houses. The plan below shows the location of the H1 site. We are aware that the H1 site generated a significant amount of local opposition during the production of the LDP, and although an independent planning reporter raised some concerns about it Scottish Ministers directed us to include it in the final version of the LDP. The allocation of this site in the LDP means it is considered appropriate for housing development in principle. However, in the meantime two planning applications to develop houses on the site were recently refused by the National Park Authority. This leaves a degree of uncertainty over the future development of the site. 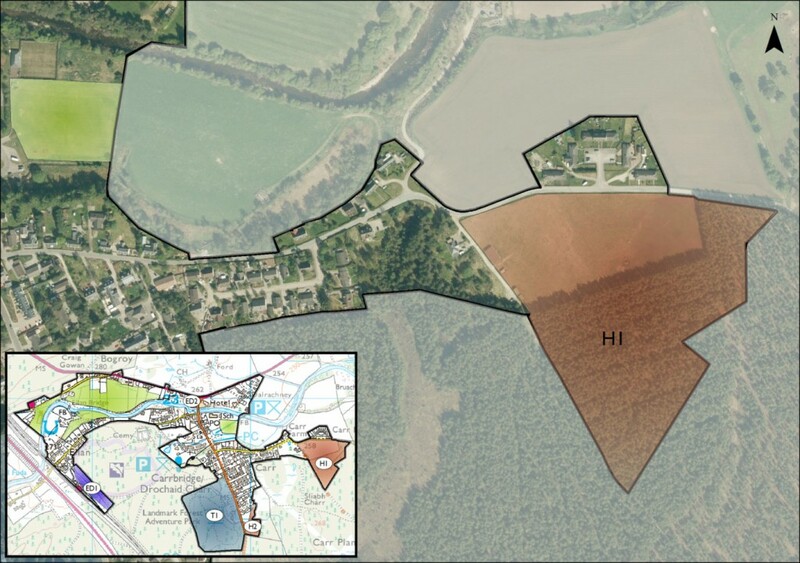 To help resolve this, we have produced a Draft Development Brief for the H1 site. This aims to give more clarity on the most important issues that any future housing development on the site should address. We are now looking for views on the Draft Development Brief. It is important to be clear that this consultation is not an opportunity to reconsider whether the site is appropriate for housing development. However, the Development Brief provides an important opportunity to influence how the site should be developed in a way that best benefits the Carr-Bridge community. By giving us your views you can help us to achieve this. You can give us your views on the Draft Development Brief by completing our online response form. All responses must be received by 5pm on Friday 3 February 2017. We have arranged two drop-in events where members of the planning policy team will be available to answer questions and explain more about the consultation. These will be taking place at Carr-Bridge Village Hall from 2-7pm on 6 December 2016, and from 2-7pm on 17 January 2017. Alternatively, you can contact Dan Harris on 01479 870553 or by email at [email protected]. After the consultation closes we will consider all the comments made and report them to the National Park Authority’s Planning Committee, who will decide the final content of the Development Brief.